With plenty of fresh powder on the ground, we look at how climate change is changing our region’s ski industry; and learn why the sport now comes with such a high price tag. We also hear about how Providence, Rhode Island is grappling with being a “sanctuary city.” And we get inside the unique, intensely democratic process that is a New England town meeting. The late-winter nor’easter that dumped snow across New England on Tuesday and Wednesday was a welcome sight to the region’s ski areas, which have been seeing shortening ski seasons in the past decade, due to climate change. 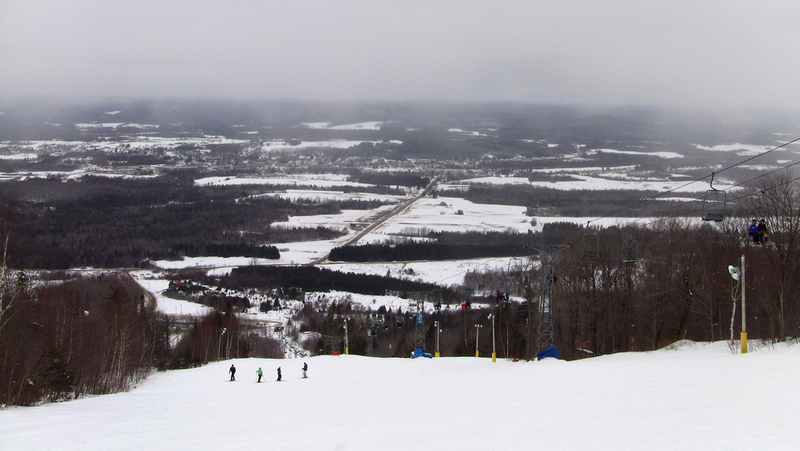 According to University of Waterloo climate scientist Daniel Scott, no ski area in southern New England will remain profitable after 2040. 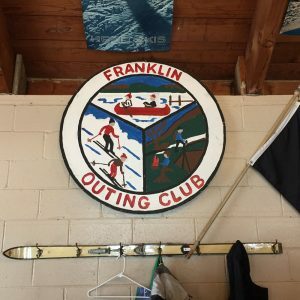 As Maine Public Radio’s Fred Bever reports, ski areas in northern New England could benefit. A hand-painted sign hangs on the wall at the Veterans Memorial Recreation Area in Franklin, New Hampshire. Photo courtesy of NHPR. Skiing is a pricey hobby. A lift ticket at Sugarloaf in Maine will run you $95. At Stowe in Vermont, it’s $124 for the day. Even at Ski Sundown, a small mountain in Connecticut, a ticket on a Saturday or Sunday costs $60. But at Veterans Memorial Ski Area in Franklin, New Hampshire, admission is just $20. Instead of a chair lift, there’s a metal bar that goes behind the thighs, attached to a rope that pulls skiers up the 230-foot hill. Whose Sanctuary is it Anyway? President Donald Trump has pledged to crack down on so-called sanctuary cities — jurisdictions that shield undocumented residents from federal immigration officials, mainly by refusing to comply with requests for local law enforcement to help enforce immigration law. Under Trump’s January 25 executive order, these cities could lose federal funding. The president and his supporters say the order is an attempt to improve public safety. But advocates claim that people living in the United States without documentation are more often victims of crime. They say that when police cooperate with federal immigration officials, community trust is eroded. 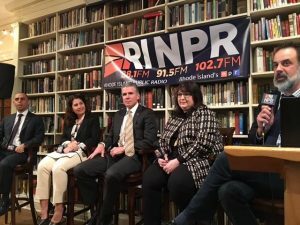 Earlier this month, NEXT host John Dankosky moderated a forum about sanctuary cities in Providence, Rhode Island; where Mayor Jorge Elorza, like other urban mayors, has voiced open opposition to the order. Elorza and other panelists debated where local law enforcement ends and federal law enforcement begins. Listen to the full event audio from Rhode Island Public Radio. Explore stories about immigration in New England from the New England News Collaborative series Facing Change. This past Tuesday was Town Meeting Day in New Hampshire. And while some towns rescheduled because of the big winter storm, New Hampshire’s Secretary of State there said the law requires towns to hold their local elections on the second Tuesday in March, regardless of the weather. 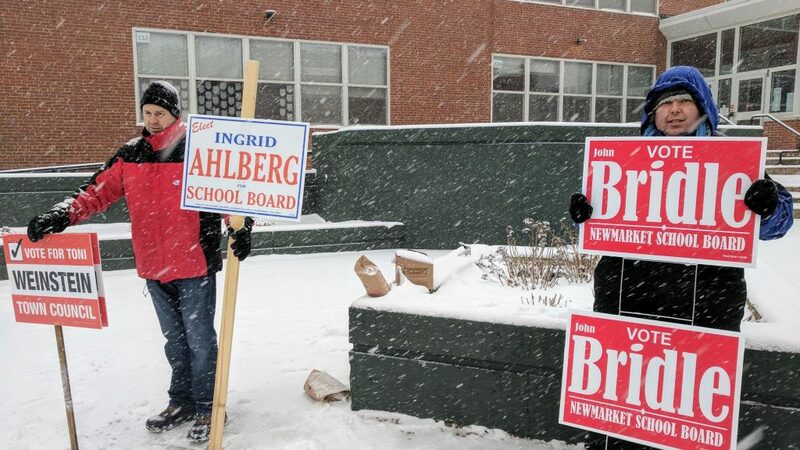 In Newmarket, school board candidates and many voters toughed it out. New Hampshire Public Radio’s Jason Moon reports. Candidates and survivors braved the elements Tuesday in New Market, NH. Photo by Jason Moon for NHPR. While residents of towns like Newmarket cast ballots, other New England towns hold traditional town meetings. That’s when citizens gather in a church or school gym to debate, deliberate and ultimately vote on a budget, and other municipal business. Town meeting is a tradition unique to New England in the United States, and goes back to colonial times. But an increasing number of towns are giving up the public debate in favor of a ballot-based system. So, is the tradition worth preserving? On Vermont’s Town Meeting Day, Vermont Public Radio’s Howard Weiss-Tisman sat in on a town meeting where the future of town meeting was up for debate. 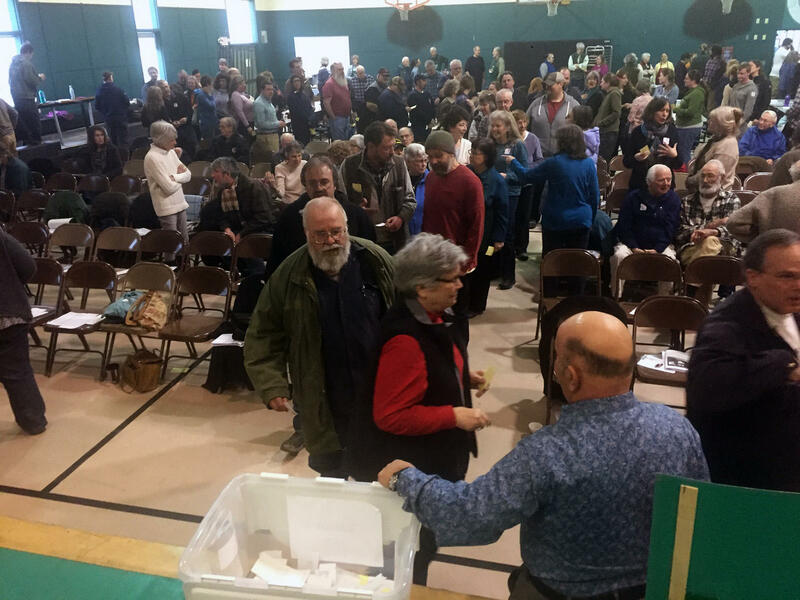 Meeting-goers in Tunbridge, Vermont cast paper ballots in a non-binding vote over whether to oppose a new residential development. Depending on town rules, votes can also be cast verbally or by a show of hands. Photo by Rebecca Sananes for VPR. So what’s so special about town meeting, and just how much power do attendees hold? For answers, we’re joined by Susan Clark, author of All Those in Favor: Rediscovering the Secrets of Town Meeting and Community, and Slow Democracy. Clark serves as moderator at her town meeting in Middlesex, Vermont. In Woodstock, NH, chickens in the road are no laughing matter. Photo by Angela N. via Flickr. 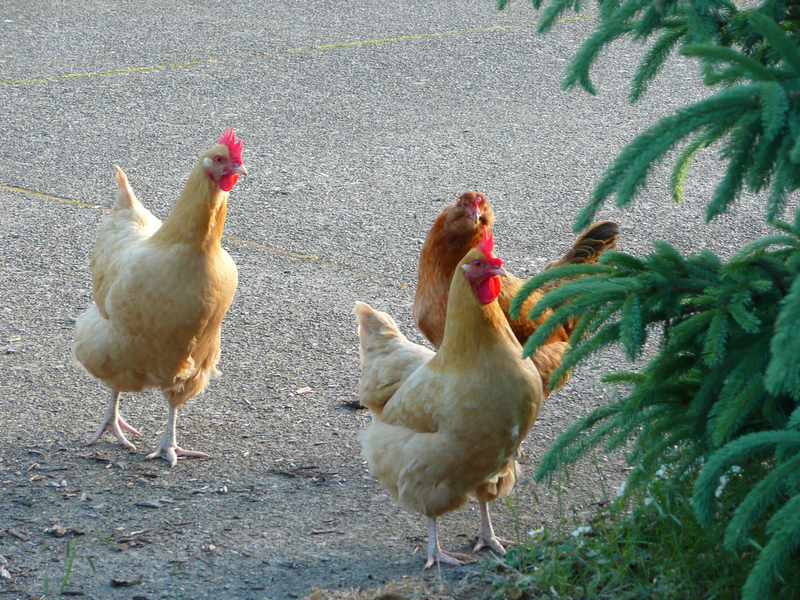 And in Woodstock, New Hampshire, population 1,400, the main issue of town meeting this year was trespassing… by chickens. There’s no state law regarding the caging of fowl in New Hampshire, and some residents’ chickens have been roaming onto neighbors’ property, and even blocking traffic. How was the chicken fight resolved? No spoilers: you’ll just have to listen. Special thanks this week to Dekama Welch. We appreciate your feedback! Send praise, critique, suggestions, questions, story leads, and town meeting minutes to next@wnpr.org.